but the price was in the range I was willing to spend for a puppy at the time. When I arrived at the seller's home, I was greeted by two furry-looking animals. They were the parents of the puppies. I was not extremely impressed. I saw the puppies; there were six, four white females and two black males. paid the breeder and away we went. Her name became Natasha Ebonovna. 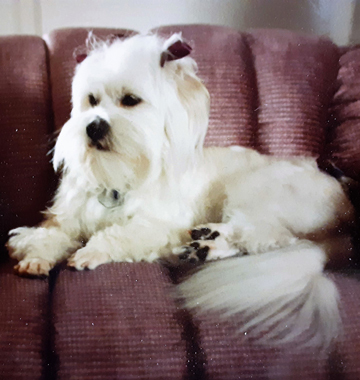 Natasha was a white fluffy ball of fur that grew to be about fourteen inches tall. She was single coated, and never could grow a coat of any length. She was certainly a lovely pet. 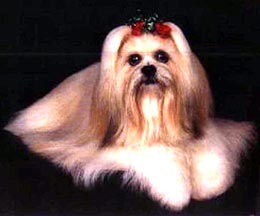 At that time I was unaware that there was a standard for how Lhasa Apso is suppose to look. I just knew that I loved her a lot and decided that I wanted her to be a mommy. Again, I returned to my local newspaper and found a Lhasa for stud. I was very excited. I made the hour drive to the stud owners' house. They presented this old black and white dog. I didn't really like that dog, but it was too late to find another stud. That dog tried for about an hour to "take care of business". I was afraid that dog was going to pass out or have a heart attack. CH Camelot Royale ROM* they had purchased as a show prospect. When they let him loose, he took care of the job in nothing flat. We started to think that maybe Natasha just might produce a show dog. Natasha had a healthy litter of five. We selected a golden male puppy which we named Sabastian Camelotovich. We started attending local dog shows so our little show dog could watch his father compete. and his wife Thelma together now known as T-Ritz Lhasa's. I asked Thelma to evaluate our little show prospect. She very politely indicated that it might not be very cost effective to show Sabastian and invited us over to her house to see her dogs. At Thelma's house we saw many beautiful Lhasas, but there was one in particular that caught our eye. In a small wire kennel inside Thelma's bedroom was a beautiful bouncy little female puppy. Thelma told us that she was available if we were interested in owning a show dog. With a little hesitation in adding a third dog to our already crowded apartment, we agreed. That new puppy became CH T-Ritz That's Ardy's Abigale ROM. By the age of thirteen months Abbie had completed her championship. She is the foundation behind every Ardy's Lhasa and continues as the foundation of Jaron's Lhasas.